India is one of the oldest civilisation in the world, spanning a period of more than 4000 years, and witnessing the fusion of several customs and traditions, which are reflective of the rich culture and heritage of the country. The history of our nation gives us a glimpse into the magnanimity of its evolution -from a country reeling under colonialism, to one of the leading economies in the global scenario within a span of fifty years. More than anything, the nationalistic fervour of the people is the contributing force behind the culmination of such a development. This transformation of the nation instils a sense of national pride in the heart of every Indian within the country. ‘FREE INDIA’ was a dream of all Indians under the British rule. Everyone during that rule fought with a common aim of ending British and other colonial authorities in India. After a century of revolutions, struggle, blood shedding, battles and sacrifices, India finally achieved independence on august 15,1947. The Independence Day of India, which is celebrated gloriously throughout the country on 15th of August every year, holds tremendous ground in the list of national days, since it reminds every Indian about the dawn of a new beginning, the beginning of an era of deliverance from the clutches of British colonialism of more than 200 years. It was on 15th august 1947 that India was declared independent from British colonialism and the reins of control were handed over to the leaders of the country. India’s gaining of independence was tryst with destiny, as the struggle for freedom was a long and tiresome one, witnessing the sacrifices of many freedom fighters, who laid down their lives on the line. India was free in 1947 from the British empire but the country lost many men and women who were filled with undaunted courage and spirit of patriotism. These Indians with their true spirit and courage had faced various tortures, exploitations and hardships to earn us freedom. Today, they are known as freedom fighters because they sacrificed their lives for their motherland. 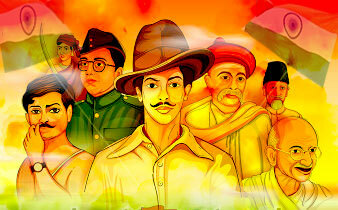 The freedom fighters of India played an extensive role in getting independence for the country. The ‘revolt of 1857’ was the first war of independence of India. Mangal Pandey is considered as a hero in the modern India because he had played a pivotal role in beginning the revolt against the British. besides him, Rani Lakshmibai is considered as the symbol of resistance to the British rule and was one of the leading figures of the rebels in 1857. It was none other than the father of our nation- Mohandas Karamchand Gandhi who gave a push to the party and raised the struggle for freedom in a non-violent way. His non-cooperation movement was a remarkable success and a stepping stone for Indian freedom struggle. There were many other freedom fighters who had fought for the nation and sacrificed their lives. The pioneers of the freedom movement were Mangal Pandey, Tanita Tope, Rani of Jhansi and Mahatma Gandhi who introduced non-violent ways of fighting the enemy. Other notable freedom fighters of India include Annie Besant, Lala Lajpat Rai, Bal Gangadhar Tilak, Bhagat Singh, Bipin Chandra Pal, Sukhdev, Gopal Krishna Gokhale, Chandrashekhar Azad, Sarojini Naido, Dadabhai Naoroji, Sucheta Kriplani and Chakravarti Rajagopalachari. It has been almost seven decades since India gained independence and the country has progressed at a faster pace. The nation has been growing economically and socially and is heading towards development. If these freedom fighters had not contributed in the freedom struggle, the current situation of the country would have been different. India, the democratic republic might not have headed for success. We are independent and free today only because of the efforts and sacrifices made by our country’s freedom fighters. So, this 15th August, as we celebrate our 72nd Independence Day, let’s all take a moment to salute and pay respect to all these great men and women who laid down their lives, so that we could breathe the air of dignity and freedom. Wishing everyone a very happy Independence Day!! !